Need more information about our high flow carpet extractor? Check out our knowledge library below. As always, don’t hesitate to reach out with any further questions. Take a look at a variety of documents, videos, and comparisons between Steamin Demon carpet cleaning equipment and the traditional truck mount. I bought my first Steamin Demon four years ago and now have a total of three. We do a lot of Apartment turns and flood work, and they are still going strong. They do a great job and are easy to use. You can count on me as a very satisfied customer, and I would be pleased to share some of my ideas. It’s not just a commercial carpet machine but truly an all around performer and moneymaker. We are cleaning 30-50 apartment units a month, plus insurance restoration, water and fire jobs. With daily clean up and of equipment we are totally satisfied and have had very little maintenance of this unit. We have been very pleased with the responsiveness of the Steamin Demon Company to our needs. When parts are needed they are shipped right away, and when questions arise the answer is but a phone call away. I recommend the Steamin Demon without hesitation. I have two truck mount cleaners and I can’t get either one of them to consider changing over so I use my Steamin Demon for commercial and high-rise condos which I do a lot of. Much better than any portable on the market. I got the steamin demon today and I already cleaned a small office, and i was so happy with the results, perfect machine, you can see really when the carpet is clean. After the porty shootout I knew I wanted that machine so I found it and I bought it it was used, but almost brand new and with 150 ft of hoses total, i am very happy, one more machine for my collection! This is part 1 of a 2 part series that demonstrates how the Steamin Demon portable extractor and corresponding carpet cleaning equipment stands up to a Vortex Truckmount carpet machine with rotovacs. We continue with part 2 vs. the Vortex Truckmount with Rotovacs. Watch as these two quality carpet machines go head to head in a carpet cleaning duel. This is part 1 of a 2 part carpet care series showing how simple it is to set up and use the Steamin Demon carpet cleaning machine. You've seen part 1, now continue to part 2 for more on setup and use of our carpet cleaning machines and equipment. Simplicity and Functionality is what we are after. Today we present to you the new technology of high flow extraction. High flow extraction is a patented process for carpet cleaning machines. The Steamin Demon uses 4-8 times the amount of water compared with conventional carpet cleaning equipment. Watch this 8 minute video and see for yourself how our carpet machine, using the high flow extraction process, can remove more dirt in a shorter amount of time. 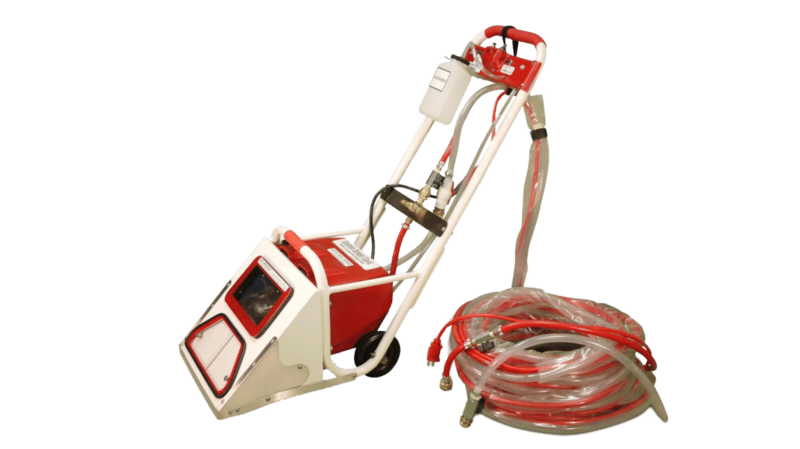 Each Steamin Demon comes with a generous length of supply and drain hose, which eliminates the need to carry water, and fill and drain as is necessary with a conventional portable carpet machine. The Steamway Truckmount is a very expensive piece of carpet cleaning equipment that can get the job done. Watch this video as we compare how our portable Steamin Demon carpet extractor and carpet cleaning equipment to the Steamway. The results will amaze you! This is part 1 of a 4 part video series. Getting started with your Steamin Demon carpet cleaning machine. Here we focus on the important maintenance items critical to keeping your Steamin Demon in top cleaning condition. Part 2 of our training series deals with getting set up to clean. We show you the various faucet adapters, hooking up the water supply line and drain line, and preparing our carpet care regime. Moving on to part 3 we see the Steamin Demon carpet cleaning machine in action. Part 4 is a quick summary of the training, as well as a review of the operations manual for the Steamin Demon and corresponding carpet cleaning equipment. Our Steamin Demon carpet cleaning equipment is unconditionally guaranteed to be the best portable carpet cleaning machine(s) you've ever used. If after 2 weeks of receiving your carpet cleaning machine(s) you do not agree, we will arrange to have your machine(s) shipped back and you will be refunded in full. This guarantee applies to pre-qualified customers only where all training is provided by Steamin Demon Inc.